Out with the boring, in with the exciting! 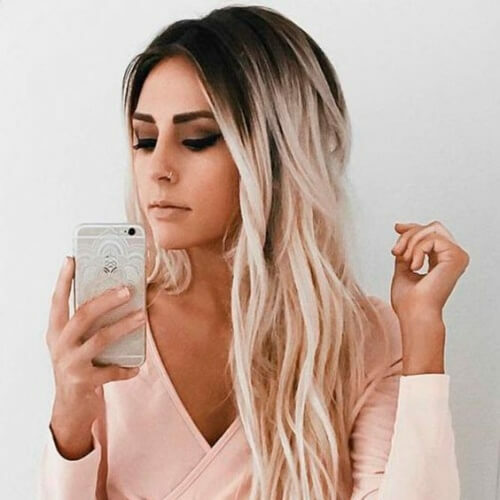 Two tone hair is rapidly gaining traction among trends this year, and we can totally understand why. It allows us to get creative with our hairstyles in a super fun way. Whether you want natural tones or intense hues, check out all of our two tone hairstyles below for major inspiration! You’ll often find two tone hair ideas with a darker bottom and a lighter top. However, you can go against the grain and do the exact opposite for a truly memorable hairstyle. Try mixing a black top with a blonde bottom, for example. On the other hand, you can choose to combine your colors vertically instead of horizontally. In this regard, we recommend picking a lighter color for the area towards the front of your face. You can test brown hair in the back with blonde locks in the front. Also, you can have loads of fun picking half and half colors for your two tone hair idea. Just an example is this eye-catching copper and burgundy mix. We love how the colors are evenly separated by the side part here. It was impossible for us to talk about two tone hairstyles without bringing up one of the hottest trends of the year – shadow roots. Whether you decide to grow your natural roots or darken them with hair dye, we recommend shadow roots as one of your go-to options. If you have long hair, you can have loads of fun experimenting with different tones. For instance, you can color the lower part of your hair in black or dark brown and leave a honey blonde for the top coat. You’ll be edgy and chic all at the same time. Nevertheless, if you want a more feminine approach to your two tone hair, go for it! You can pick two girly colors, such as pink and purple, and go for an irresistible half and half look. The idea is amazing for girls with bangs who want to stand out. We’re no strangers to ombre hair and the massive influence it has had in the industry for the past few years. If you’re into sharp but stylish gradients, we definitely recommend ombre for your two tone hairstyle idea. As an alternative, you can choose to melt your two colors for some eye candy. Whether you choose platinum and plum, like in the photo above, or any other colors, you’ll look amazing. 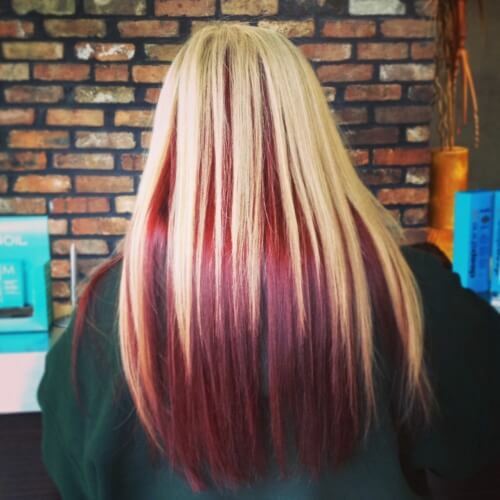 Work with a professional colorist to get the results you’re aiming for. For as far back as we can remember, black and white has always been the top combination for contrast. Whether it’s used in fashion, beauty, or any other aesthetic area, you can’t go wrong with it. 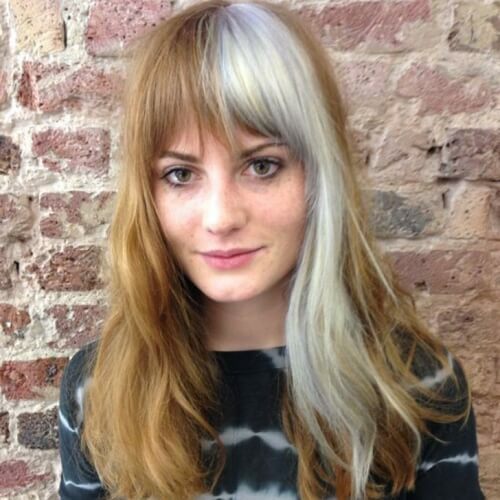 Liven up your locks with a black and white two tone hair idea. If you feel that black and white is too bland for you, explore the colorful options you have at hand. As far as two tone hair is concerned, you can go all out with any shades that fit your personality. Turquoise and magenta are sure to make your locks pop. 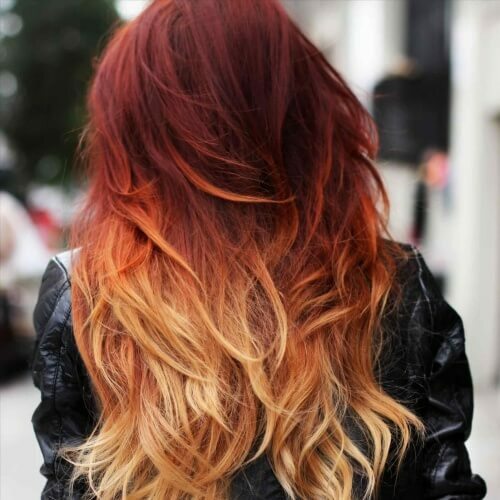 There’s something truly special about ombre hairstyles inspired by fire. For your two tone concept, you can work in the velvety red and spicy orange tones that are found in flames. We particularly recommend this version for girls with long hair. Not all two tone hairstyles have to be symmetrical. In fact, plenty of women look outstanding when the dye only specific sections of their hair. 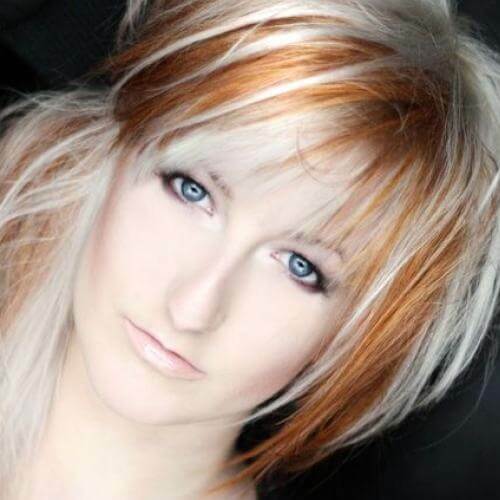 Try coloring your tips and even the undercoat of your bangs for a high fashion look. 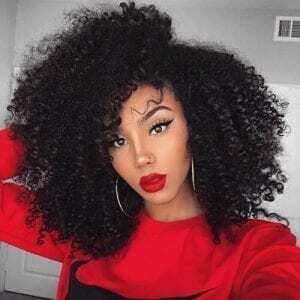 African American women can always count on two tone hair ideas for accentuating their already gorgeous ringlets. If you have naturally curly, dark, and textured hair, you should consider an earth tone for your secondary color. Women with medium-length hair can opt for a natural approach to their two tone locks. Instead of going for a dramatic transition from one block color to the other, you can choose to ease in your second tone. Colors that belong to the same palette work the best for this version. 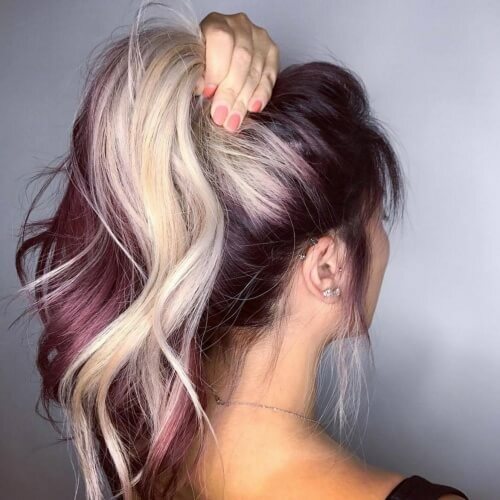 Once you have your two tone hair set up, you can start thinking about hairstyles that will flattering your creative coloring. One that you’ll never get sick of is the messy bun. In addition to clearly showcasing both colors, the messy bun also provides a comfortable hairstyle for the bearer. 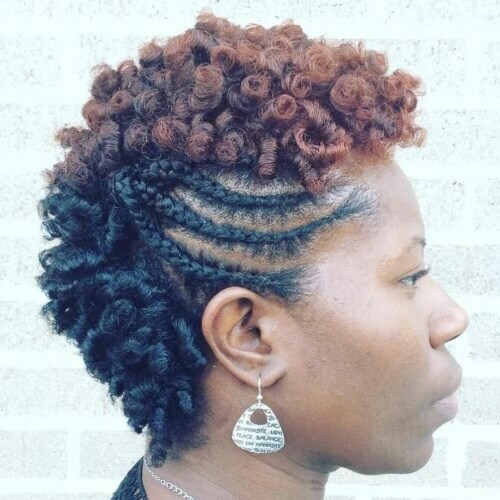 Braids are a wonderful “canvas”, so to speak, for two tone hairstyles. 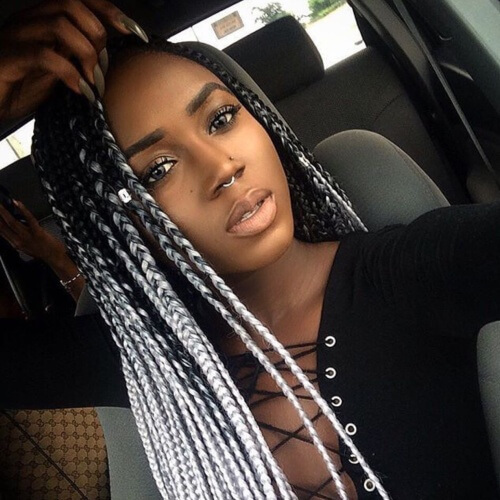 There are plenty of African braids you can look into for your hairstyle, such as Ghana braids. Leave the top your natural hair color and blend out to your favorite hue for the extensions. 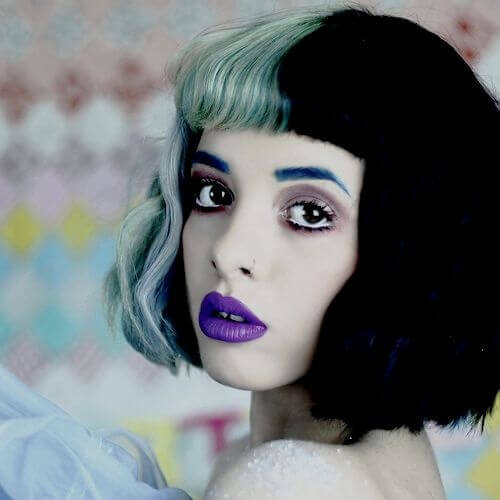 Melanie Martinez proves that contrast can have a major impact on your overall appearance. What better way to incorporate contrast into your style than through your hair? Feel free to experiment with soft mint against jet black hair. 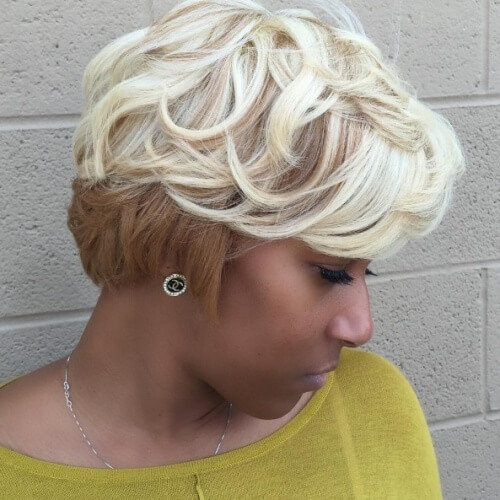 We love the creativity that was put into this two tone hair idea. Although you’ll need a professional hairstylist to get a similar outcome, we whole-heartedly recommend the approach. Focus on your bangs and the layer beneath your top coat of hair. Moreover, you can try out highlights for your two tone hairstyle. One of the all-time best combos is blonde and brown, but don’t hesitate to test the technique with any shades you like. The higher the contrast, the better the look will turn out. Want an unconventional hair color combination that will make you look fab? Ash blonde and copper hair is for you! You can keep the majority of your locks ash brown and add layers of copper throughout your hair. 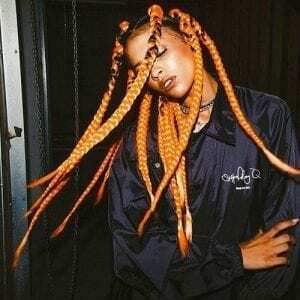 Just like Ghana braids, box braids are glamorous when colored in two tones. 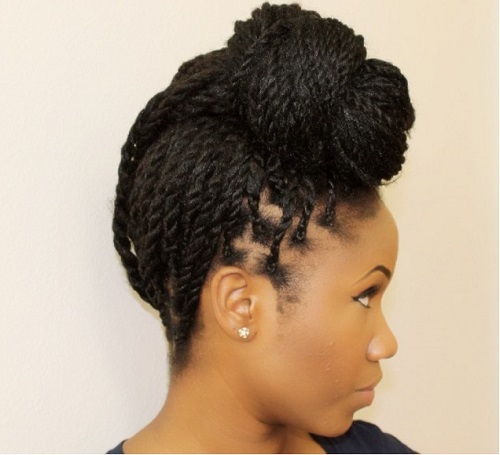 Just like with the first braids we talked about, we suggest leaving black for the top portion. After that, go crazy with your favorite colors for the rest of the braids. The success of your two tone hairstyle also depends on the type of haircut you pair the colors with. If you’re a rockabilly girl, have fun with a black and blonde hairstyle with short, blunt bangs. The outcome will be impossible to resist. 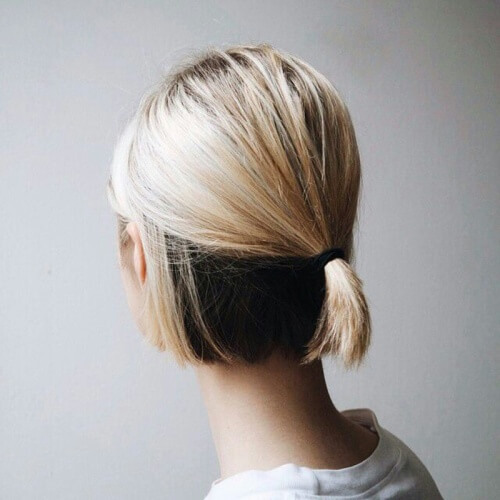 Contrary to what some girls may believe, two tone hair is possible with shorter haircuts. 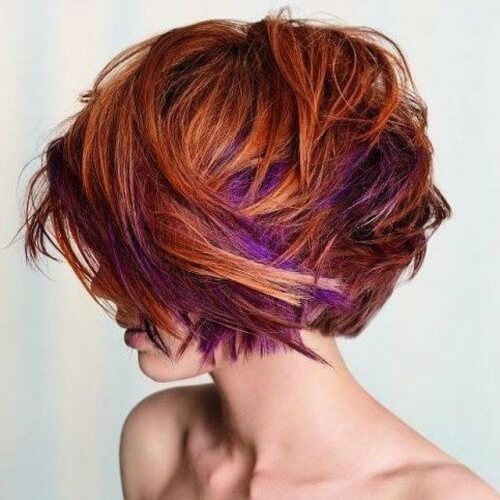 For example, if you have a pixie cut with long bangs, you can bring it to life with a layer of color on top. To get your desired results, use black for the lower portion and a lighter color for the top. We’re all for ombre hairstyles, but we’re well aware that the abrupt transition isn’t flattering for all women. 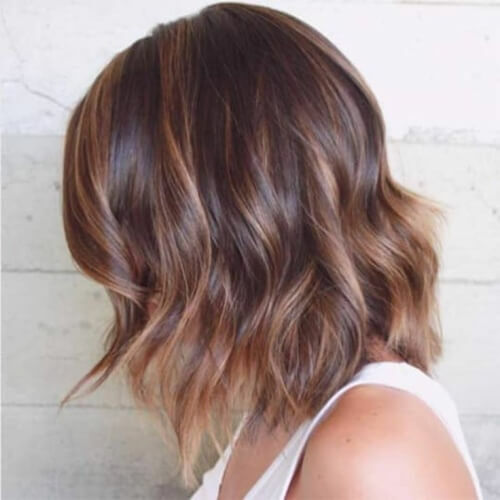 If you want a smoother gradient, go for two tone hair through balayage. The primary color will gracefully slide into the secondary tone. Cherry red and sunny blonde? Yes, please! There are few two tone combos that grab attention as much as blonde and red. After you apply your candy red undercoat, brighten the top with pieces of blonde all around. In many cases, you’ll find two tone hairstyles with contrasting colors. Be that as it may, some women become total knockouts with lighter combinations. If you have an olive or dark skin tone, a platinum and dark honey two tone hairstyle will look fabulous on you. Alternatively, you can use the same colorway but with a different technique. Instead of separating the platinum and copper in two distinct coats, you can use one of the tones for a smaller area of your hair. It’s yet another cool idea for girls with bangs. 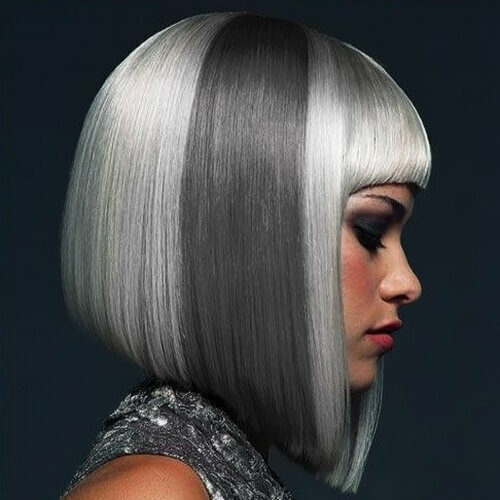 You can also use platinum in combination with colors from a similar palette, like ash blonde/ brown, silver, or gray. By using the darker tone in the back, you’ll be emphasizing the platinum on the top and towards the front. Have you always been fascinated by the idea of mermaids? You can now look like one with your hairstyle! 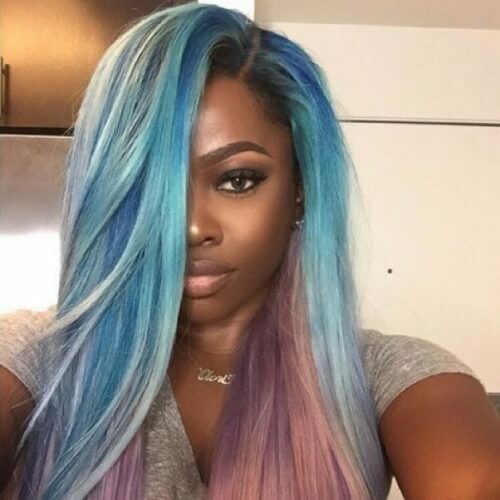 Mermaid hair has been constantly trending for the past year, using sea-inspired colors. 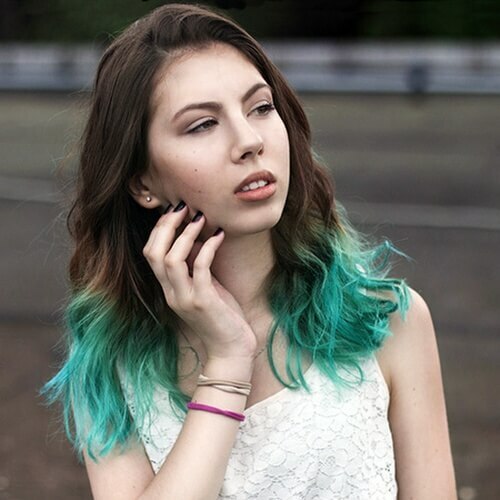 Pick indigo and turquoise for a two tone mermaid hairstyle. To get back to platinum for a moment, you can rely on a wine red hair color for your combination with it. The two exciting tones will complement one another glamorously, providing a dramatic hairstyle that you’ll love. Are you just as naughty as you are nice? Express your bittersweet attitude through your hairstyle. 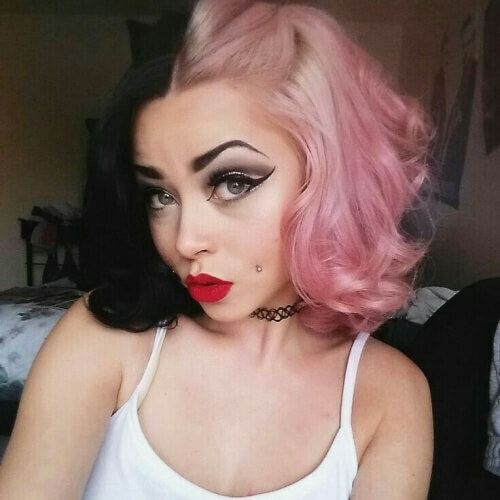 You can go for a half and half look with black on one side and cotton candy pink on the other. The contrast will be deliciously striking! 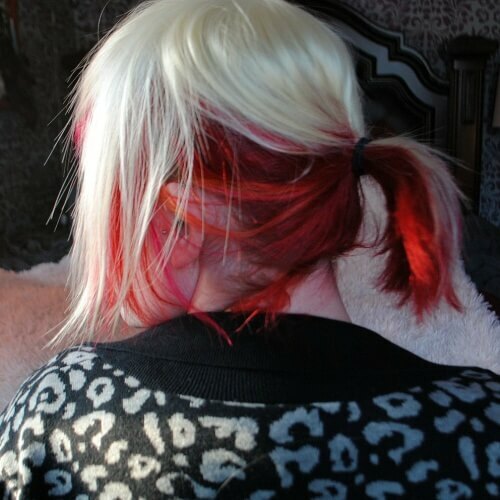 Some girls want to keep their natural hair color as part of their two tone hairstyle. If you have brown hair, for instance, you can choose a brighter hue for the second tone. Turquoise looks astounding, but you can also try out blue, pink, green or orange. Few hair colors go as well together as black and purple. 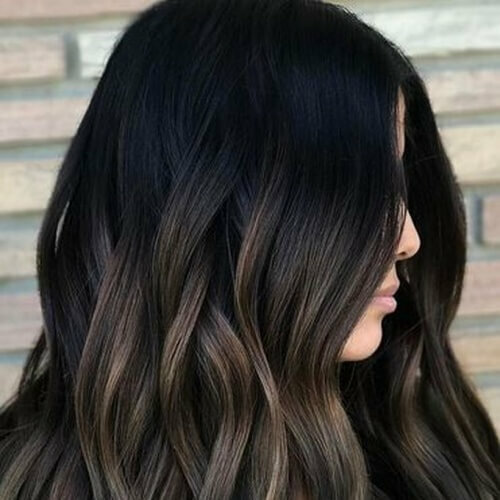 Natural brunettes should seriously consider using a vivid mauve for their two tone hair, whether through highlights, ombre or balayage. The mixture looks lovely on women with all eye colors and skin tones. 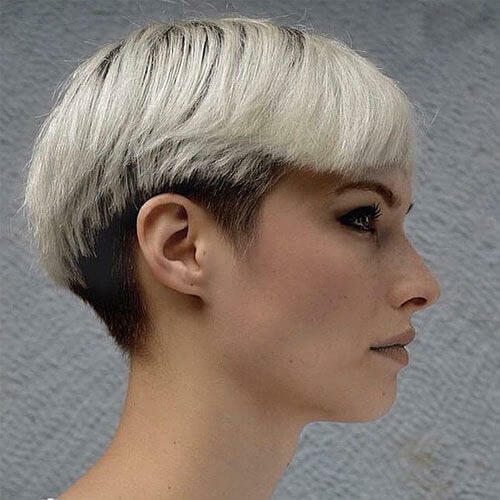 We’re delighted to see that undercuts are becoming more and more popular among women. 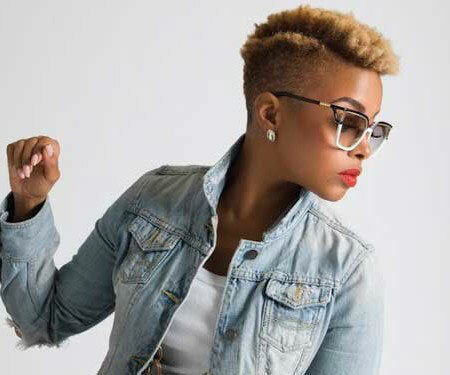 If you love rocking short and edgy hairstyles, you can consider mixing in two tones for yours. Use a darker shade for the undercut part and a lighter one for the rest of your hair. Still, if you don’t want a flashy hairstyle, you can always go for elegant subtlety with your two tone hair. For this approach, we recommend maintaining your natural hair color and adding a tone that will complement it smoothly. 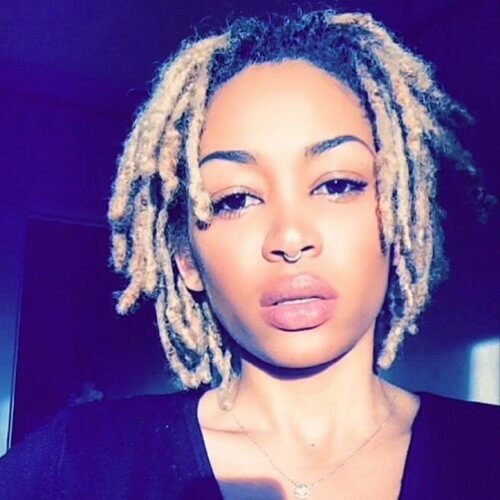 Dreadlocks are already a super cool hairstyle. But what if you took yours to the next level by sporting them in two tones? We especially recommend the idea for girls who plan on getting dreadlock extensions for their hairstyle. This way, you’ll be adding the color without damaging your natural hair. We’ve talked all about the benefits of peekaboo highlights in the past. In a nutshell, they’re a fun, creative, and playful way to spice up your hairstyle. For two tone hair, you can use the peekaboo method for an undercoat you can conceal or reveal at your leisure. 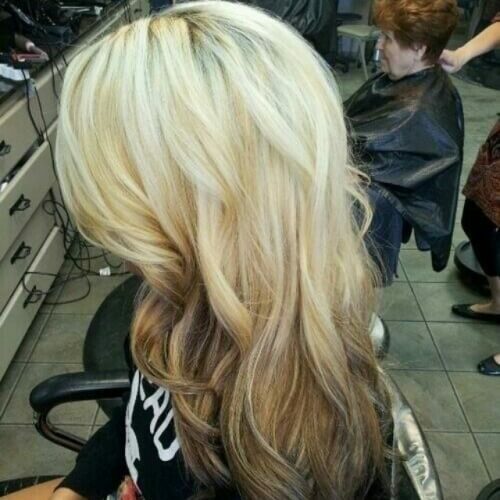 Brunettes don’t even have to go through that much struggle to obtain a flattering two tone hairstyle. Considering that black hair is rich through its nature, you can choose to blend out to a warm, intense shade of chocolate brown. Sometimes, all you need is a splash of contrast to get a marvelous hairstyle. A full blonde hairstyle can easily be upgraded with the help of a few dark accents here and there. The results are even nicer on women with long, side-swept bangs. There’s no doubt that pastels draw attention and, most importantly, admiration. Top them off with a two tone coloring technique and you’ll have a spectacular hairstyle you’ll be proud of. Pick your favorite pastels and go! 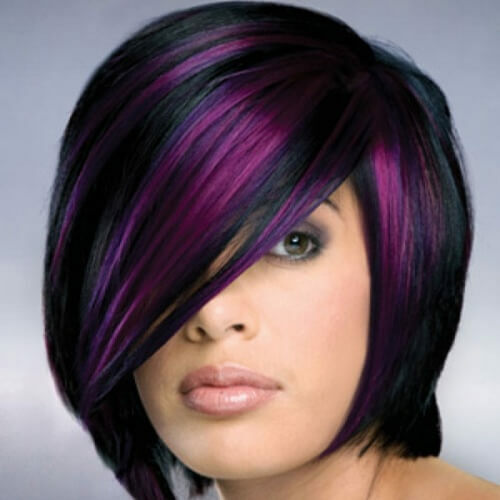 If you want a two tone hair idea that you won’t see on every other girl, take some time to think about unusual colors. You can also make use of your natural hair color, especially if you’re a redhead. Sprinkle in some bright purple for a fantastic look. Want a neat look for the day at school or at work? 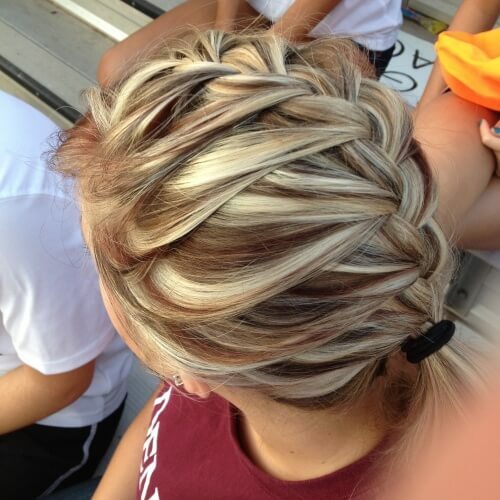 It’s easy; all you have to do is braid your two tone hair! 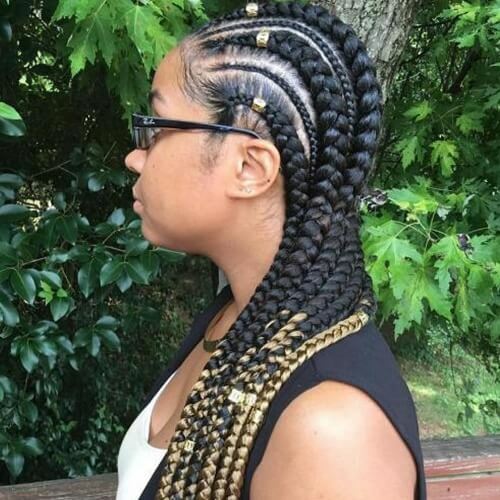 We suggest exploring braiding techniques that will make your two distinct colors stand out. 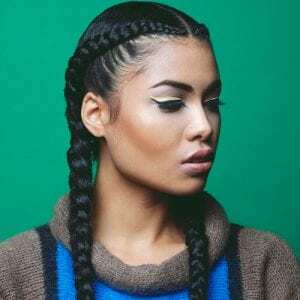 French, fishtail, and Dutch braids are all great examples. A harmonious combination of highlights and lowlights can be the perfect idea for your two tone hairstyle. Blonde and reddish brown, for example, go amazingly well together. We recommend the blend as a feminine look you can rock all year round. 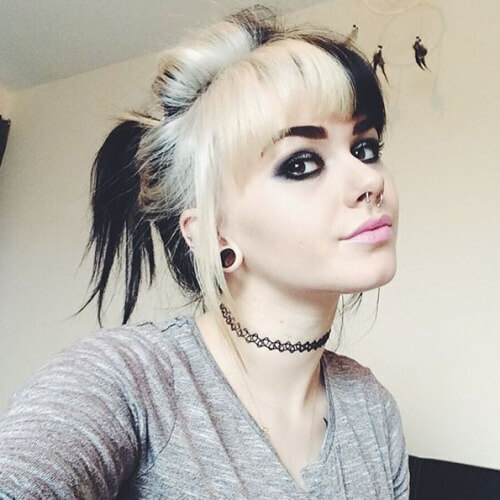 Plenty of scene and emo hairstyles for girls involve mixing two hair colors in an unconventional way. 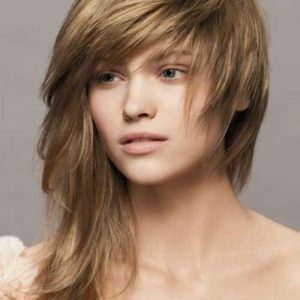 If you love wearing long bangs swept to the side and shorter layers on long hair, upgrade your emo hairstyle with two tones. 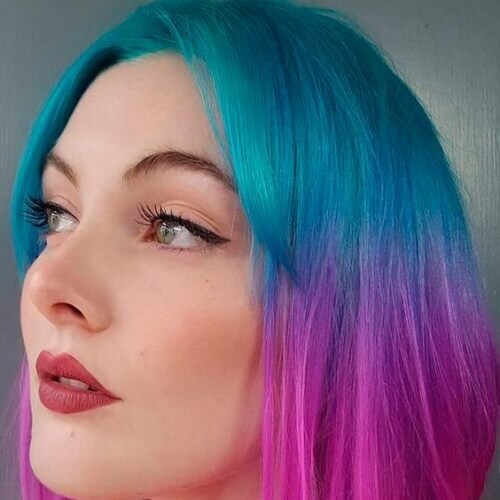 Some hairstyles are the perfect foundation for playing around with colors. The faux hawk, for instance, becomes even more attention-grabbing with two tones. It’s one look you can’t miss out on if you have long braids. 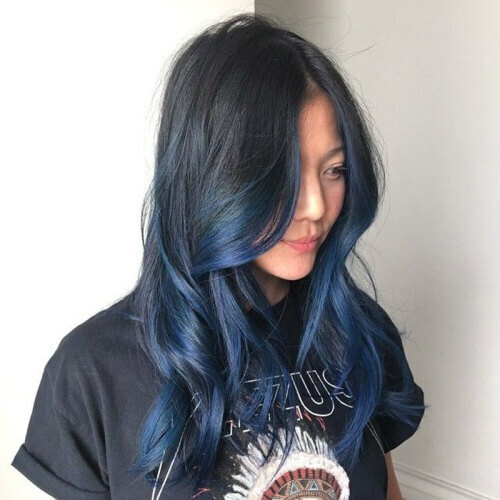 Just like black and purple, black and blue go terrifically well together for dark and mysterious hairstyles. To get results similar to the ones in the photo above, talk to your hairstyle about applying a contourage coloring technique. If you’re an artist or have an artistic soul that isn’t constrained by a traditional workplace, you have to check out this hairstyle. Not only does it use eccentric colors, but it’s also accentuated by an equally artsy haircut. Half and half colored hairstyles look absolutely brilliant with pigtails. Owing to the nature of pigtail braids, your colors will each stand out beautifully. You can try boxer braids out for a trendy and flattering approach to two tone pigtails. 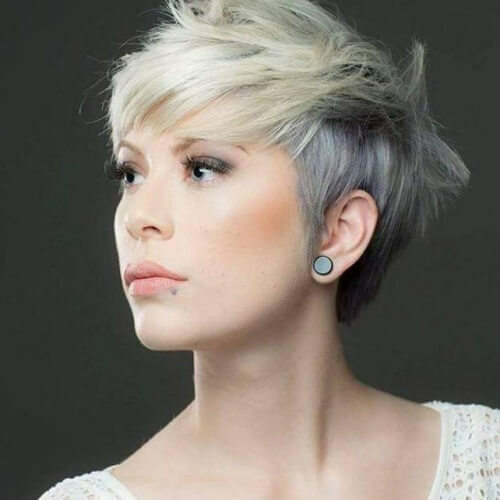 Gray, silver, and ash hair are still maintaining firm positions among hair trends. Instead of using one of these colors for a block tone, why not combine two of them? A primarily silver coat, for example, will shine with a darker section of gray. 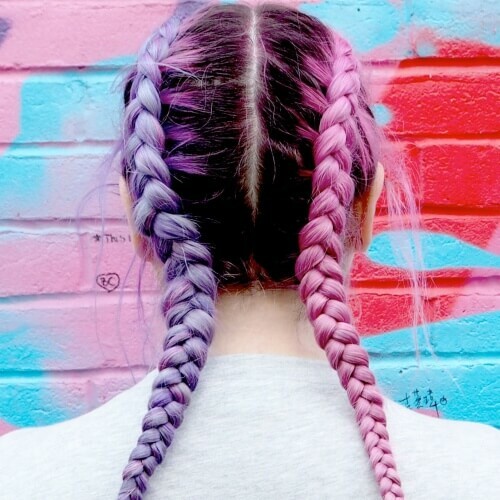 Finally, here’s a cute and edgy hair idea that will bring out your colorful side. 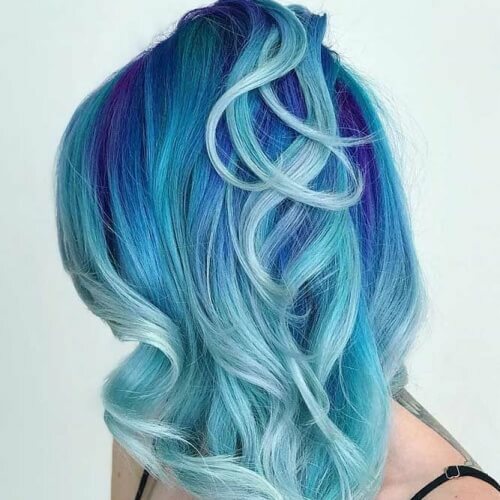 Aqua hair typically involves shades of turquoise and navy blue, hence the name. Find the best way to combine them and you’ll have a head-turning hairstyle for sure! To conclude, the possibilities are limitless with two tone hair. Although similar or complementary colors are popular approaches, you can let your imagination run free with your hues. Pick your favorite colors or what you feel would flatter your features the best. When you’re done, make sure you tell us what your choice was in the comments!